I don’t know what it is but I am loving the grill right now. Maybe it’s because when I grill, I feel like cleanup is easier. Or maybe it’s because I can pull a hot meal together without heating up the house. Or maybe it’s because it rained for so much this spring that I’m grateful to be in the sun. 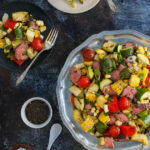 Whatever the reason, this recipe for marinated skirt steak and grilled vegetables is the perfect excuse to get outside and light the grill. My other current love is going to the farmer’s market every Saturday, getting inspired by all the beautiful produce that is available now, and picking out whatever looks best to make for dinner. So, it’s no wonder this has been a favorite meal lately: farmer’s market vegetables + hot grill = happy times. Use the recipe below more as a guide. Feel free to add or swap out the vegetables based on your own preferences and what looks best at the market. The first time I made this recipe, there were some gorgeous oyster mushrooms at the farmer’s market that I threw on the grill with the other vegetables. They were an amazing addition! You can also choose to not grill the cherry tomatoes and just toss them fresh into the salad. However, I highly recommend the slight smokiness of grilled tomatoes. An easy basil balsamic vinaigrette, used as both a marinade for the steak and a dressing for the salad ties everything together. This is easy summer dining at its best. In a bowl, whisk together the olive oil, balsamic vinegar, basil, parsley, garlic and a couple of pinches each of salt and pepper. Place the skirt steak in a baking dish or zip-top bag large enough to hold the steak. Pour about 1/3 cup of the marinade over the steak and turn the steak to coat evenly. Reserve the remaining marinade as a dressing for the salad. Marinate the steak for at least 1 hour at room temperature or up to 6 hours in the refrigerator. On a rimmed baking sheet, generously, season the vegetables with salt and pepper. Drizzle the vegetables with olive oil and toss until the vegetables are evenly coated with oil. Put the tomatoes on skewers if desired. Grill the vegetables, turning occasionally, until tender with nice grill marks, 10 to 15 minutes. The corn may take up to 25 minutes. The tomatoes and green onions will only take 1-2 minutes. Move the vegetables to a clean rimmed baking sheet as they finish cooking and tent with foil to keep warm. Remove the steak from the marinade and pat the steak dry with a paper towel. Grill the steak, flipping once, until grill marks form on both sides and cooked to your liking, 8-10 minutes for medium rare. Transfer to a cutting board, tent with foil and let rest for 5 minutes. While the steak rests, cut the bell pepper, squash, and zucchini into large pieces. Cut the corn kernels from the cob. Chop the green onions. Remove the tomatoes from the skewers. Arrange the vegetables on a large platter. Season with sea salt, if desired, and gently toss. Slice the steak against the grain into thin slices, then slice again with the grain to create bite size pieces. Arrange steak over the vegetables. Drizzle some reserved dressing for the salad and serve passing remaining dressing alongside. Recipe adapted from Fine Cooking, Aug/Sep 2015.